For many years, Davey jet assisted centrifugal home pressure systems have been the benchmark for reliable household pressure. Jet Pumps are excellent and robust choice, especially for smaller systems up to 35 litres per minute, or for larger systems with long suction lines or suction lifts. Davey Jet Pumps have excellent wear resistance and air handling ability, contributing to their well earned reputation for reliability. 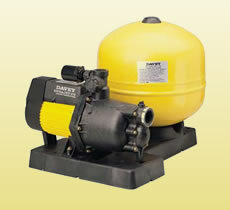 Customers refer and trust a Davey Jet Pump for their home.